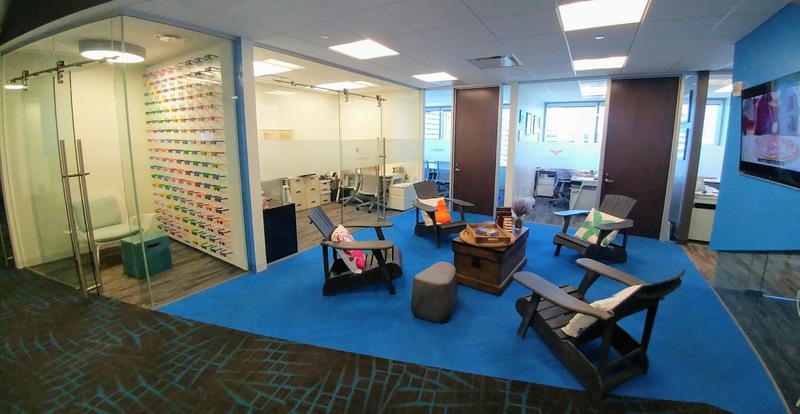 KensTrends Blog - Business Brokerage and Commercial Real Estate,Ken's Trends | Find Your Perfect Office Space In Record Time! Welcome to the award-winning KensTrends. I was just named “Newest Blogger” in the Top 10+ CRE Blogs of 2018 by theBrokerList, a top online community of Commercial Real Estate Professionals. No, it wasn’t Best Blogger, Most Comprehensive Data Insights, or even “Top CRE People to Follow on Twitter”, which I made in 2011 under a different persona. But I’ll take what I can get. Easy access to Miami or Fort Lauderdale, high image 15-20 employees? Presidential Circle in Hollywood. Downtown Miami, executive suite, lots of privacy, financial firm? Regus at The Wells Fargo Building. Glitz and glamour of Miami’s Brickell Avenue, small space, short-term lease? The Latitude. Live/work/play, access to 2 airports and all of South Florida? Main Street Miami Lakes. Tech startup, millennial employees, rapid growth, close to Mass Transit? WeWork at Miami’s Security Building. 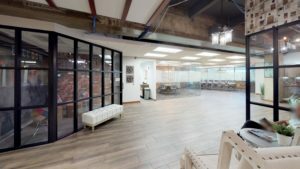 Friendly coworking atmosphere, lots of natural light, half-hour from Downtown Miami or West Palm via Lime scooter and Brightline Train? Pipeline Lauderdale. 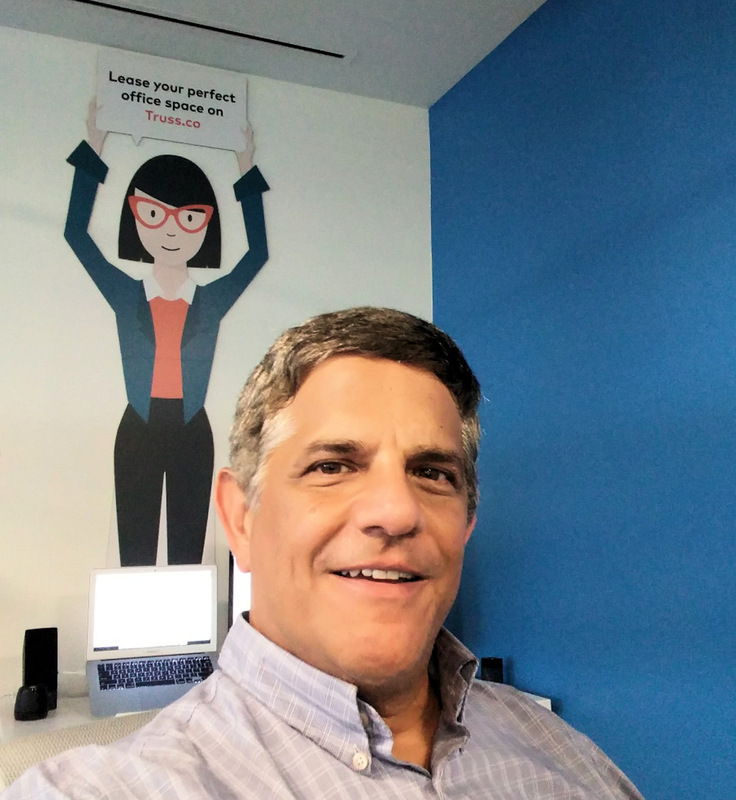 Vera then searches our inventory of over 12 million square feet of available office space and over 100 coworking facilities in South Florida, rating each space on a 1 to 100 scale. In each of our 9 (and expanding) US markets, Truss employs a seasoned professional broker who uses his or her experience and Vera’s technology to find our clients the best space at the best value. Vera makes sure I don’t miss any buildings and supplements my own market knowledge and experience with hard data. One of Vera’s most important features other than her great smile is that she provides our clients with full price transparency. Net lease, gross lease, modified, who cares. Vera is able to boil it all down to a monthly or annual cost to compare all alternatives on an apples-to-apples basis. Technology will never fully replace a broker, but a seasoned broker armed with the latest technology is a very dangerous creature indeed. Vera herself actually found a perfect space for a client for my client tour this morning. Okay – I am going to start my article with the surprise twist. 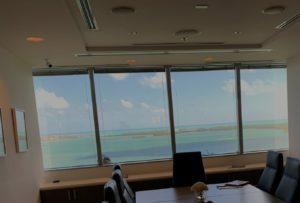 A couple of days after I started writing this post, I was asked to find a location for a tech startup looking to open a Miami satellite office in early March. Spaces at Two Miami Central was perfect. The ultra-modern center at Miami’s new transportation hub was set to open in late February. 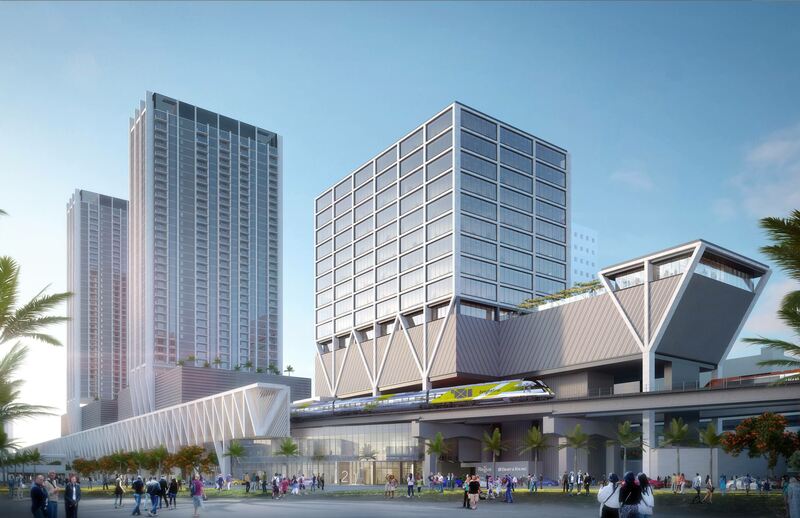 Employees could live along the Metrorail and Metromover lines and take mass transit to work. 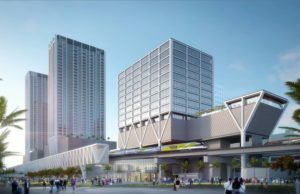 They could also hop on the Brightline Train and service accounts in Fort Lauderdale and West Palm Beach. I sent info to my client who was very excited. I called my Regus Rep only to find out that all 500 seats have been leased to a major local company. So it appears that Corporate America will be very receptive to the Spaces concept. Thankfully, I was still able to identify some great alternatives for my client on the Truss platform. 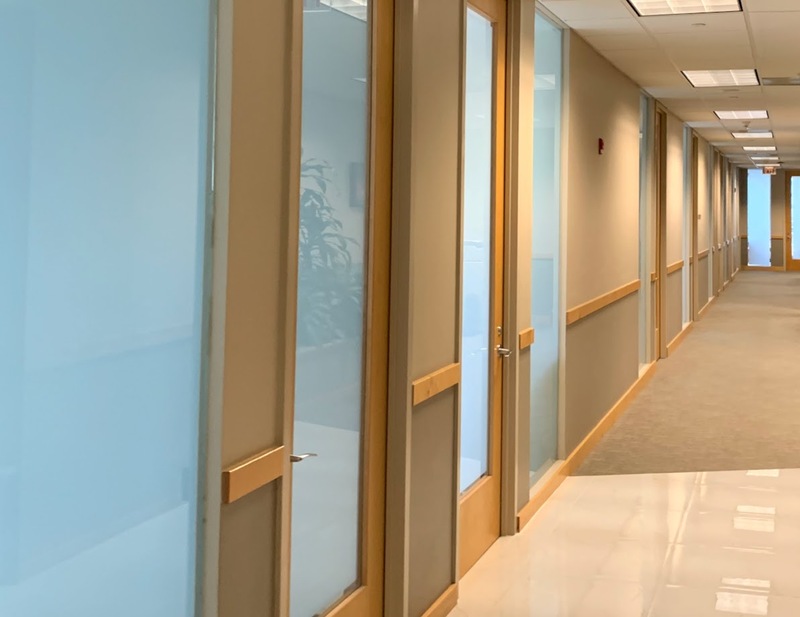 As we head into 2019 Truss is beginning to generate a lot of traction with businesses seeking South Florida office space. As I sit in my coworking space at Pipeline in Downtown Fort Lauderdale, I am wrapping up a lease on Miami’s Brickell Avenue, invoicing a deal in Kendall south of Miami, getting pricing on a Brickell coworking space, setting up one tour in Miami’s red-hot Airport/Doral submarket and another in West Palm Beach. One thing is certain – as I pointed out in Ken’s Konfessions episode 1 and 2, coworking is exploding. 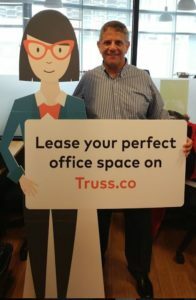 I now have well over 100 South Florida coworking centers listed for lease on the Truss Platform. Miami leads the nation with 3 percent of its total office inventory dedicated to coworking, occupancy is remarkably strong and lease rates continue to climb. WeWork is constantly in the news based on their explosive growth and their $20 billion valuation. Their facility in Miami’s $1 Billion Brickell City Centre is spectacular and remains the standard by which all other local centers will be judged. I lease a great space at Pipeline in Downtown Fort Lauderdale with lots of interior glass, nautical decor and friendly open public spaces. 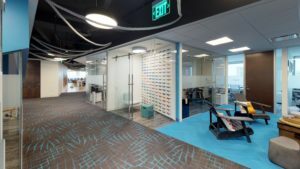 (as shown in our virtual tour) Quest, Buro, Anex, Office Edge and most recently Venture-X also compete in the coworking market with multiple locations in South Florida. But WeWork may finally be seeing formidable competition and it comes from a familiar but unexpected source. 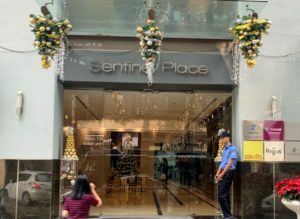 Proof of their international coverage, I was able to snap a photo of this Regus location in Hanoi. IWG Plc, with it’s flagship brand Regus is the world leader in executive coworking space with over 3,000 locations. Regus centers are generally in top Class-A buildings in major cities. They are elegant, but they exemplify the previous generation of executive suites with long corridors lit by fluorescent tubes. Coffee is billed as an add-on. It is not surprising that Regus has been losing market share to WeWork, which caters to millennials with hip open spaces, ample glass and free artisan coffees, cold brew and even cold brews. But IWG is fighting back with its new Spaces division. Spaces is a new concept aimed at capturing WeWork’s market. The first two South Florida Spaces locations are opening this month at Las Olas Square in Fort Lauderdale and Two Miami Central at Downtown Miami’s Brightline Station. 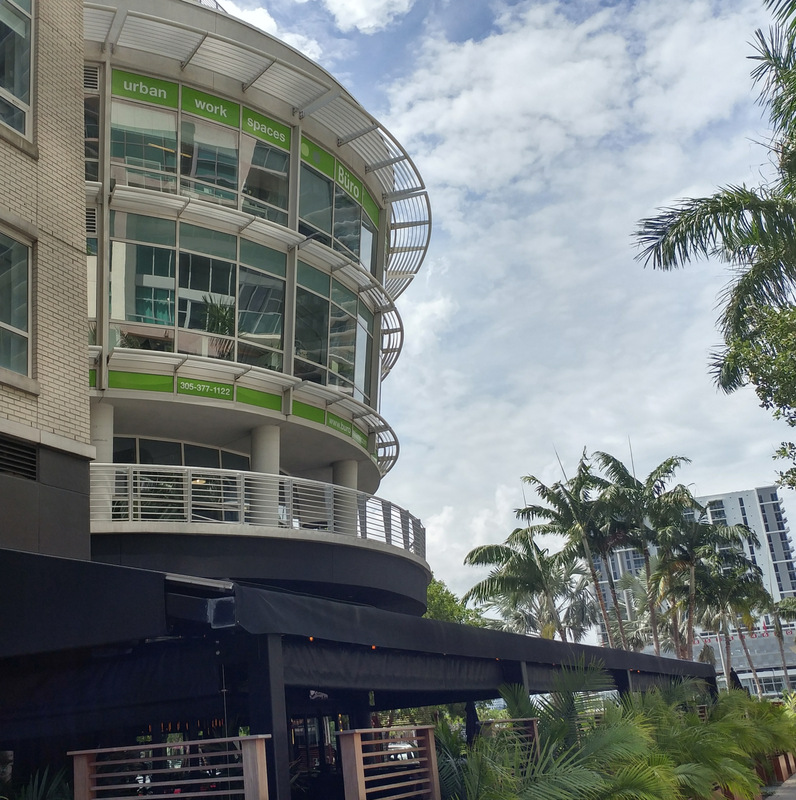 I was honored to get a preview of Spaces’ Fort Lauderdale location and wanted to pass along my first impressions and pictures of the new concept. My thanks to Arash Jamali, Area Manager for Regus. Spaces will occupy the second and third floor of Las Olas Square’s Annex building at 515 Las Olas Boulevard. Las Olas is Fort Lauderdale’s premier address for shopping, dining and business. The area is known for its great restaurants, galleries, boutiques and premier Class-A office towers. Downtown Fort Lauderdale is a hotbed of activity with over $2 billion of new development underway including upscale residential condos and rentals, hotels, retail and offices. As a coworking consumer myself, I will be facing the decision of renewing my lease at Pipeline vs. moving over to Spaces. My decision will be based on views, price, quality, networking opportunities and overall vibe. For views, I never get tired of looking at the ocean. I can see the expanding Fort Lauderdale Skyline and an occasional spec of blue from my 10th floor Pipeline office, but it doesn’t compare to the neighboring Carr Workspaces and Office Edge or Miami’s Anex Offices. I love the natural light from the floor to ceiling interior and exterior glass at Spaces. The second and third floor views are pleasant and you are close to the action along the Las Olas corridor. A key for me and for Truss is the ability to network and meet people who will eventually need office space and become customers. Pipeline’s ample glass, open spaces and tenant events help create community. 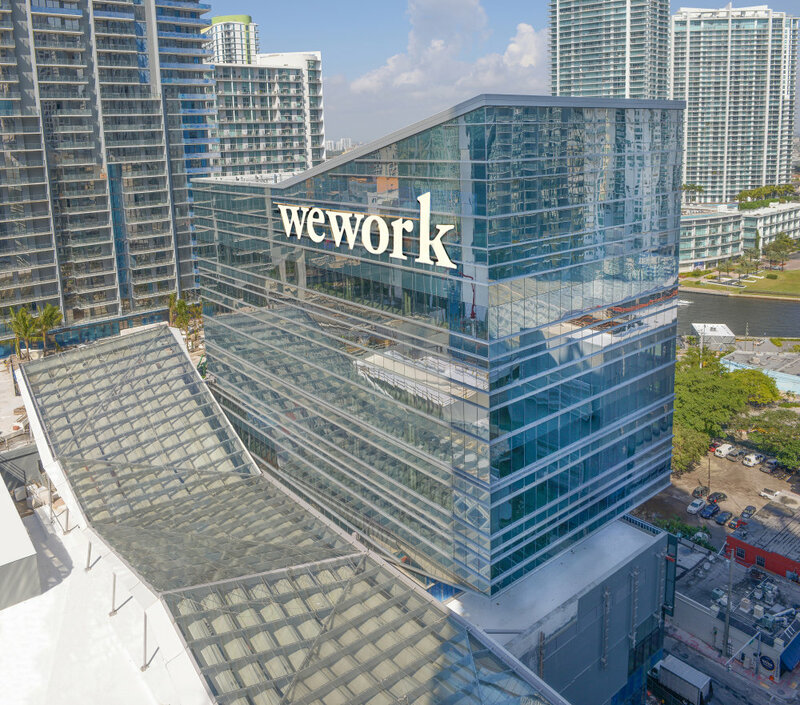 WeWork’s first Fort Lauderdale location reportedly at The Main Las Olas will not open until the project is completed in 2020. Regarding price, Spaces is going to be expensive. Interior offices will start at around $1,100 – $1,200 per month and exterior will start around $1,700. That is close to $300 per square foot. Sure, you get internet, a phone and the use of the lounges, kitchen and meeting rooms. But that is more than five times the $55 per square foot that you would pay for Class-A traditional office space on Las Olas. A $1,700 rent bill isn’t outrageous for a business owner looking for a windowed office in a premier building. And every office has ample natural light with the floor to ceiling glass on the interior. 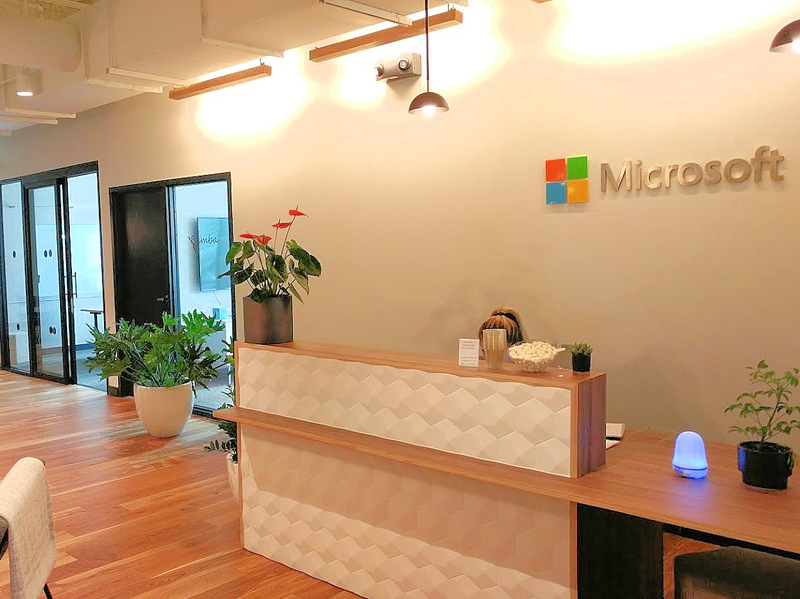 Microsoft – an enterprise tenant within WeWork’s Brickell City Centre location. 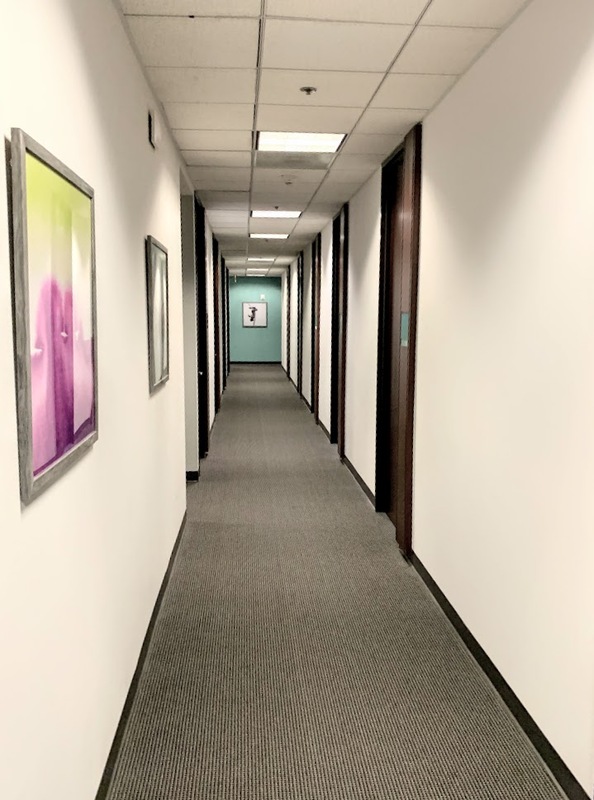 Quest has successfully competed in the local coworking market for 30 years by focusing on service and continuing to modernize their facilities. But here is where I have concerns. Spaces, like WeWork, is targeting major corporations, or enterprise users, who are increasingly turning to coworking to accommodate overflow, satellite offices and special projects. Nearly a quarter of WeWork customers are Enterprise users. Spaces will be asking around $30,000 per month for a 1,300 sf Enterprise space – roughly $276 per square foot. The question is whether this flexibility is worth the price. I can lease 1,300 square feet with ocean views for five years on Las Olas for less than the annual cost of the 1,300 sf enterprise space. Can Spaces do it? I wish them luck and hope that I can be the broker that finds the tenant to take that deal. 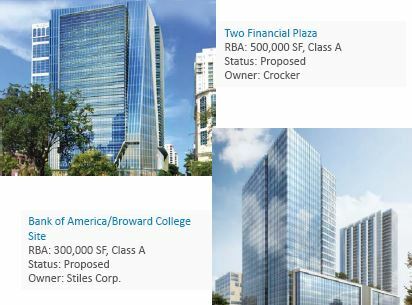 Office Edge at 701 Brickell focuses on providing services to their many legal clients. Translucent panels provide privacy while still filtering natural light creating a more modern feel. The ultimate decision on which coworking space to lease comes down to numbers as well as overall quality and vibe. Some people like the quiet, elegance and feel of the traditional executive center. It may be your father’s executive suite, but your father still needs an office and that market segment remains strong. Carr Workspaces is renovating and Regus will be converting a lot of their facilities worldwide to the modern Spaces concept. I can’t yet speak for the vibe at Spaces. Pipeline is cool while at the same time feeling warm. Buro, who has a number of centers in Miami also exudes cool and WeWork wrote the book. There is a fine line between cool and cold – the question is whether Spaces will be cool – I think it will. My decision on a space for 2019 will be based on whether the networking potential of being in a larger center like Spaces will be worth the extra expense. For Spaces, I am fairly certain that the small offices will be a big hit. Whether the enterprise tenants will be willing to pay those rents remains to be seen. (Update – I assume the tenant for Two Miami Central will paying more than the $55 market rent but less than the $300 enterprise rental rate) And if they are, how long will it be before property owners accelerate the process of bringing their coworking operations in-house? And will Ken renew at Pipeline or go to Spaces, or go for the ocean views at Carr? For the answers to these questions and more, stay tuned to Ken’s Trends and Ken’s Konfessions of a Coworking Convert. 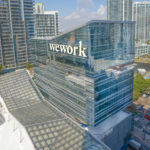 Posted in Commercial Real Estate, Coworking	| Tagged Brickell, coworking, fort lauderdale, las olas, pipeline workspaces, regus, wework	| Comments Off on CoWorking Wars – Will IWG’s Spaces Provide a “Wee” Bit of Competiton? 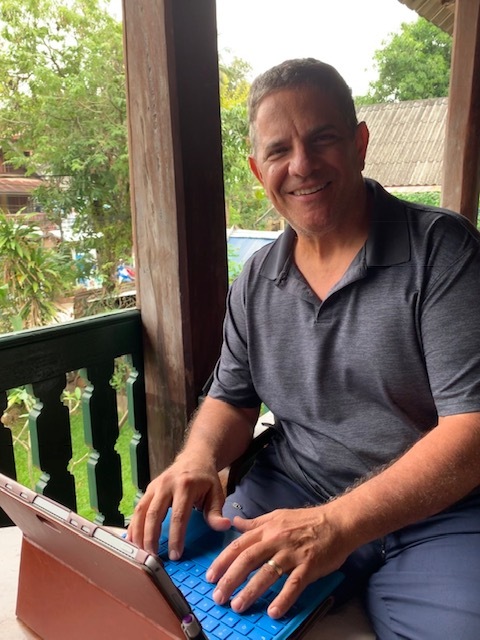 I am writing my special holiday edition of KensTrends from Luang Prabang, Laos. While my usual blog involves office leasing, today I cover the slightly more obscure topic of buffalo leasing. 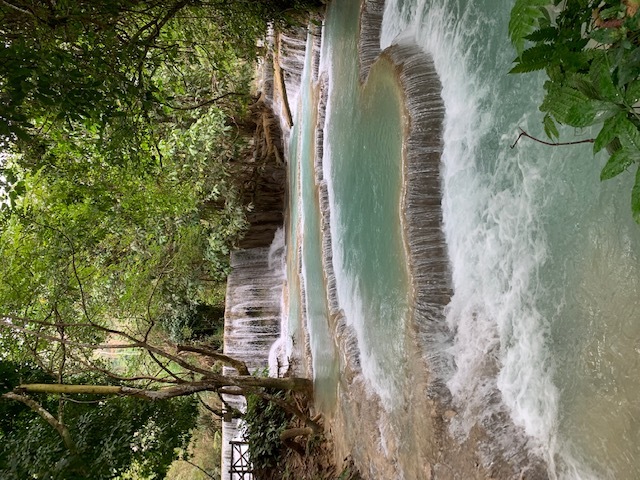 I am in Laos visiting my daughter Amanda who is on a fellowship through Princeton in Asia as a festival coordinator for The Luang Prabang Film Festival. 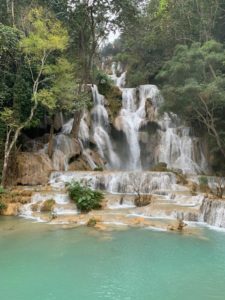 While Luang Prabang was not on my bucket list of preferred vacation destinations, it probably should have been. It has become increasingly popular since being named a UNESCO World Heritage Site in 1995. It’s only been 2 days since we arrived and it’s already been an amazing experience. 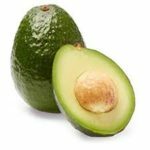 I wanted to pass along some thoughts on technology and sustainability that may make you feel a little better about the future. 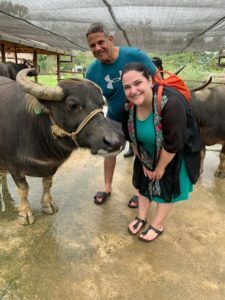 My daughter’s roommate in Laos works at the Laos Buffalo Dairy. 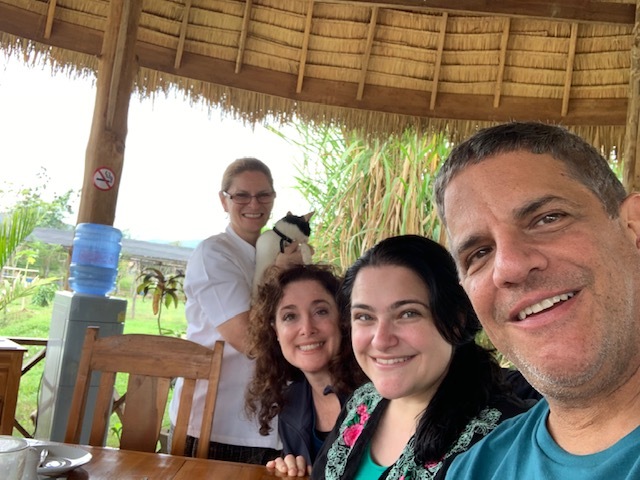 Since Amazon delivers to Boca Raton but not to Laos, we were asked to bring out supplies to help them in their cheesemaking. The dairy has quickly become one of the top attractions in Luang Prabang. 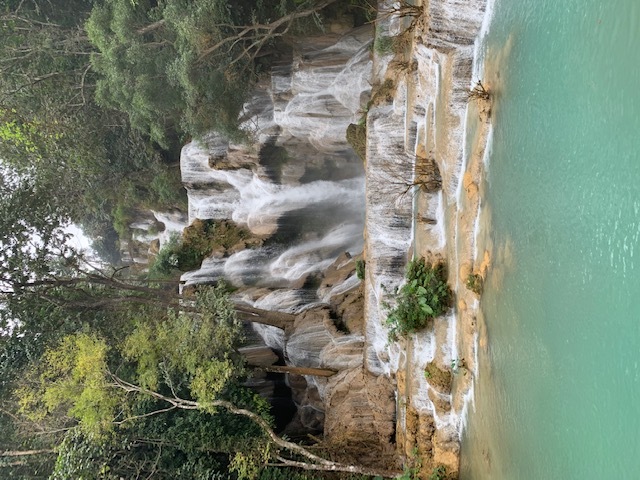 It is located 30 minutes from the city on the road to the Kuang Si Waterfall, one of the most beautiful in the world. On the way back from visiting the waterfall, we were treated to a VIP tour of the dairy with Rachel O’Shea, one of its founders. The dairy has only been open for about 3 years, but they are doing some great work. 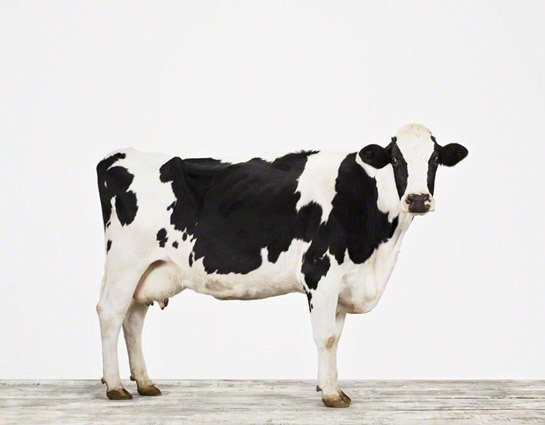 The concept behind the dairy is to lease buffalo from their local owners. The dairy feeds, vaccinates, cares for and breeds the buffalo. For generations, Lao farmers have been raising buffalo for their meat, but they never considered milking them. 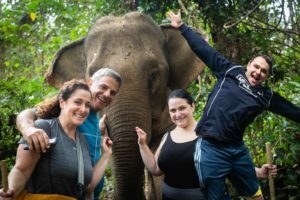 Enter in a group of American and Australian cheese lovers who were frustrated with importing expensive French cheeses into Laos and learned how to milk buffalo on Youtube. One buffalo can generate its owner around $1500 in rental income, about equal to the average annual income in Laos. I didn’t ask whether it was a net or gross lease and have no idea about buffalo cap rate trends. 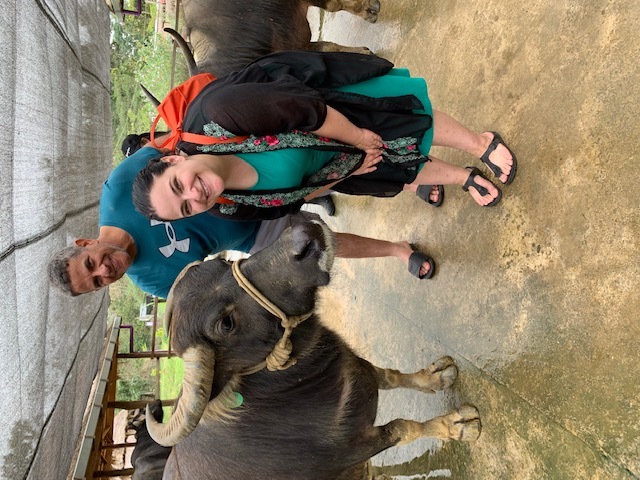 Ken, Amanda and Lola the most photogenic water buffalo in Laos. Lisa with our new friends at Mandalao. We had to photoshop in our one missing family member who had to stay behind in Seattle. Michael is the one in the blue shirt, not the one with the big ears. Happy holidays from our family. So maybe the moral of the story is that sustainability is not an either-or proposition. Rachel can have her cheese and eat it too. 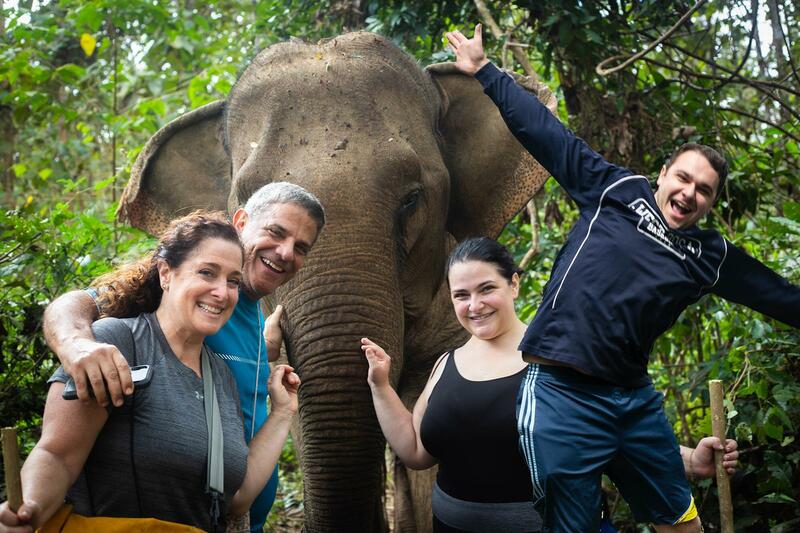 She can lease buffalo and sell the cheese to Luang Prabang’s new 5-star hotels while helping children and improving the standard of living for the Lao villagers. Rachel is also raising pigs using a litter made from rice husks, a waste product which is usually burned. The “piggie litter” is then used to fertilize the grass that is fed to the buffalo. Another initiative at the dairy is teaching the locals to breed rabbits as an alternative protein source. The advantage of rabbits is that they breed…like rabbits. 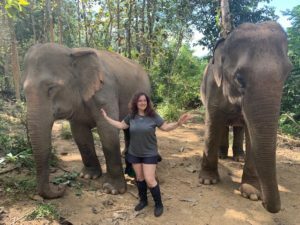 Technology is also helping reverse the decline of the Lao and Thai elephant population. Back in Boca, I recently did an office space tour in my client’s Tesla. It is sportier, faster and more luxurious than just about anything on the road. It runs without gas, and the latest models are getting more and more affordable. Yes, we have problems and we do need to acknowledge them. But it is our modern technology that provides the hope for a solution. There are some major hurdles to overcome, but for now, my glass of buffalo milk is half full. Happy Holidays from KensTrends and the Silberling family. And as our clocks are 12 hours ahead of yours on the east coast, let me be the first to wish you a Merry Christmas and a Happy New Year. 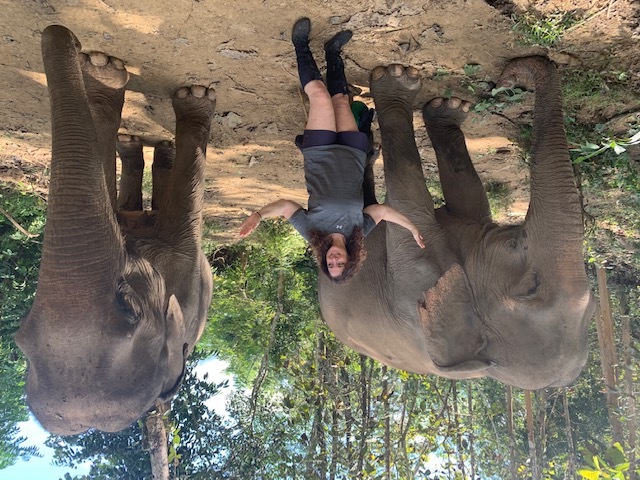 You can click on the links on the blog to find out more about visiting, contributing or investing in the Laos Buffalo Dairy and Mandalao Elephant Sanctuary. 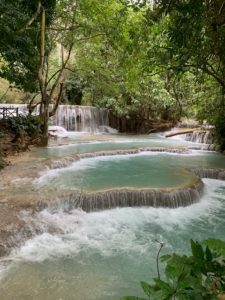 Can’t get enough of Kuang Si – amazing the Floridians were the only ones crazy enough to jump into the cold water. And don’t forget to visit Truss.co, we can’t lease you a buffalo…yet, but we are the smartest fastest way to find office, coworking, industrial or retail space. Posted in Boca Raton, Commercial Real Estate, Uncategorized	| Comments Off on Leasing, Sustainability and Why My Glass of Buffalo Milk is Half Full – Happy Holidays! If you search the commercial real estate blogosphere, you are bound to come across hundreds of articles defining what is a net lease, a gross lease, full service, modified gross lease etc. Mine is probably going to be the only article that says “Why Care?” I don’t take that answer lightly as it comes with hundreds of leases negotiated and decades of experience which has included the designing of sophisticated lease analysis templates. Truss is all about price transparency. As a business owner, you understand that real estate is one of your largest expenses. It doesn’t matter what type of lease you have, you need to know what your space will cost you every month and you need to be able to evaluate it on an apples-to-apples basis across all of your alternatives. That also includes the ability to compare traditional office space to coworking scenarios. Price transparency means boiling down all of the components of a lease into one monthly number just like a car or mortgage payment. The other most popular listing sites on the web are still all over the board when it comes to pricing. Only Truss provides true price transparency. Whether net, gross, full service or otherwise, no two leases are exactly the same. As your Truss professional, it is my job to understand the cost components of each lease and make sure they are properly reflected on our tech-enabled platform. I was recently setting up a tour with a client who had an office space budget of $4,000 per month. The tenant was able to search the Truss platform and come up with four excellent spaces to tour. When I told the tenants that our tour would be finished by 4:00, they said great because they wanted to see a space with another broker at 4:30. That took me by surprise because I was sure I had the market covered and we generally represent tenants exclusively across the entire market. They told me they were going to see a 2,200 square foot space at an asking rate of $18 per square foot. Through my own market knowledge, I instantly knew the building and the space they were scheduled to tour. It looked pretty good on the surface at $3,300 per month. But I also knew that the $18 rate was a “Triple Net” rate that did not include about $10 per square foot in operating expenses (also known as CAM) and an estimated $1.75 per square foot in electric. When I told the client that the space would actually cost them over $5,000 per month, (which is why it did not show up on the Truss search) they quickly cancelled the appointment. Time is money and by touring a space that cannot work financially, the tenants are wasting their own time, my time and the other broker’s time. Price transparency means no surprises, no jargon, no wasted time and makes Truss the smartest, fastest way to find your ideal space. Yes, your space does affect productivity and your ability to attract top talent, but the first step is to understand cost. That is precisely what you get when you and Vera, our artificial intelligence bot, search for your perfect space on Truss.co. And as your Truss professional, I’ll arrange the tour, negotiate the lease and help you understand cost as well as other factors to make sure you are getting the most value from your real estate decisions. We are excited to announce that Truss has signed on as a partner/sponsor for TEDx Boca Raton. Join us October 12 at Florida Atlantic University. The theme is Innovation – Reinventing Yourself, with some amazing speakers and entertainers lined up. 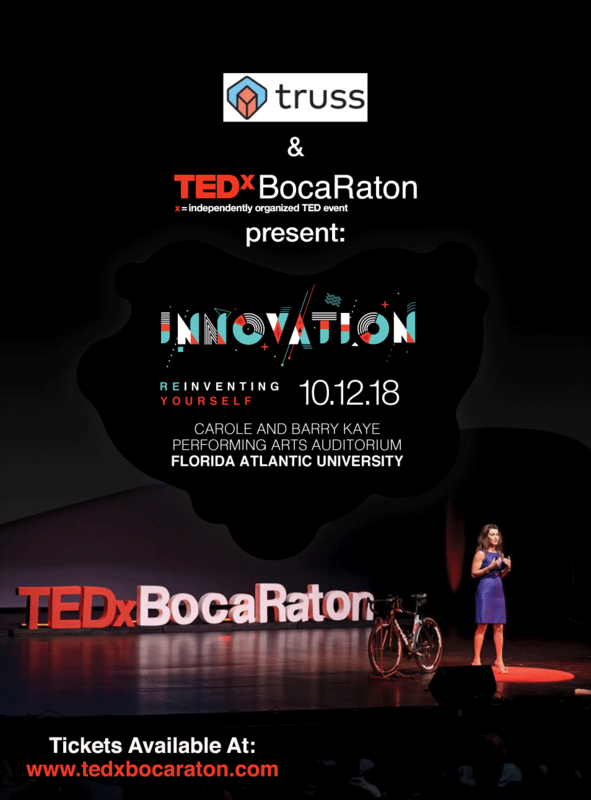 Learn more and purchase your tickets at http://tedxbocaraton.com. Use the code LASTCHANCE to get 20% off your tickets! What are TED and TEDx? TED events take more of a global approach while TEDx typically focuses on a local community. TEDx was created in the spirit of TED’s mission, “ideas worth spreading.” in Technology, Entertainment and Design. TED talks are generally 18 minutes or less in length.TED supports independent organizers who want to create a TED-like event in their own community. In the spirit of TED, we believe Truss is an idea worth spreading. Please tell your friends and colleagues about the fastest, smartest way to find your ideal office, industrial, retail or coworking space! 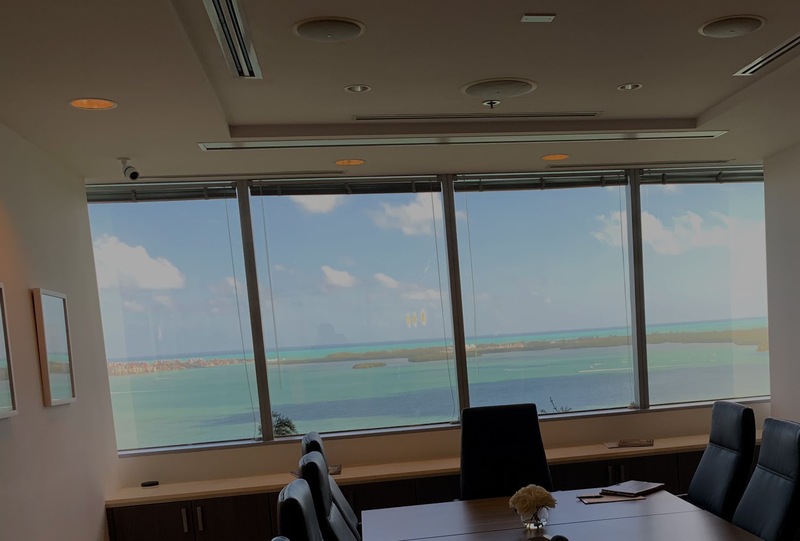 Posted in Commercial Real Estate, Coworking	| Tagged Brickell, coworking, cypress creek, fort lauderdale, pipeline workspaces, regus, truss, wework	| Comments Off on Can You Spot The Difference Between These 2 Photos? Here’s a Clue. 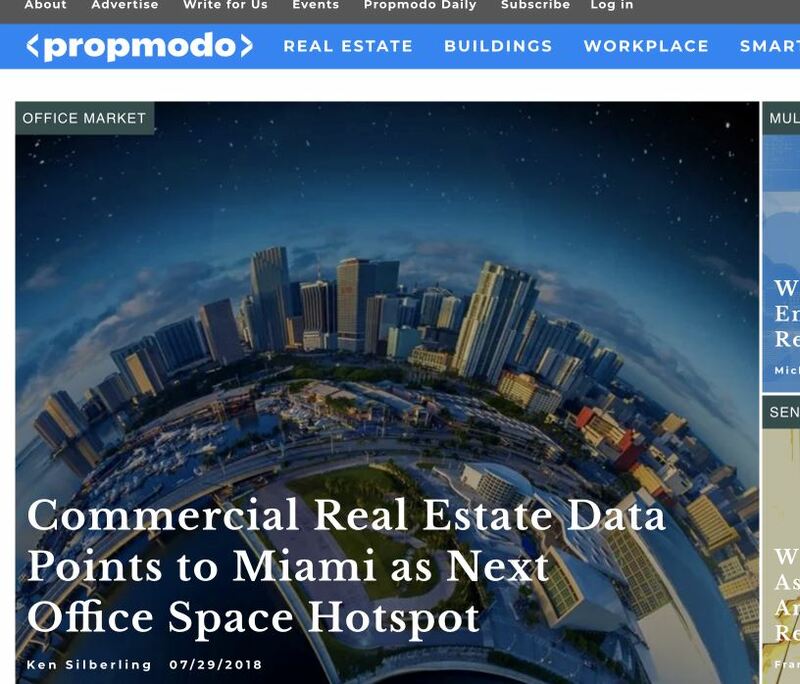 Thanks to my great marketing and PR team at Truss and the folks at Propmodo for carrying my article: “Commercial Real Estate Data Points to Miami as Next Office Hotspot” in which I explain why Miami / South Florida is a great market for Truss. Propmodo is a national blog that examines how technology is changing the way we acquire, manage and use commercial real estate. The article covers three waves of growth in South Florida and looks ahead to a possible fourth. Pretty cool being the lead story. I’ve been blogging on and off on various platforms since 2010, but this one of the highlights. 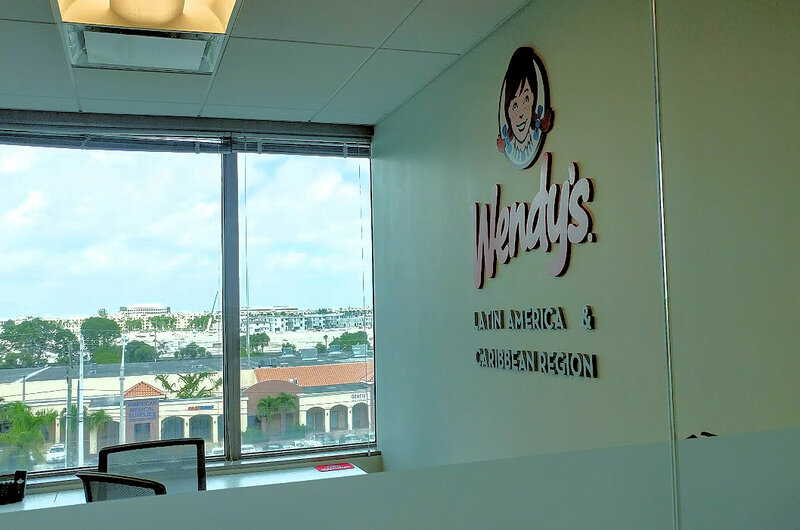 Maybe some day KensTrends will be a national blog, but right now my focus is on taking care of companies looking to lease office space in South Florida. 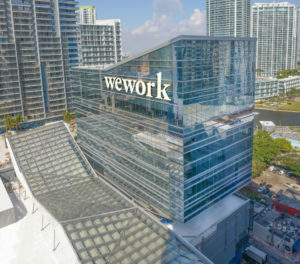 WeWork leased 65,000 square feet for co-working at Miami’s $1 Billion Brickell City Centre. CoWorking continues to generate headlines as industry leader WeWork has gone from zero to a $20 billion valuation in just eight years. Its membership doubled from 2016-17 and is expected to double again from 2017-18. Is is possible for an office provider to amass so much value without owning property? Consider Uber, ($72B) a taxi company that has created its value without owning taxis; AirBnb, ($31B) a lodging company that has done the same without the benefit of hotel ownership; and of course Amazon, ($900B) which started as a retailer without stores or inventory. Maybe there is something behind that valuation. My entire professional career has revolved around office space. I have researched the office market, represented clients in leasing office space, and acquired, developed, sold, and leased office buildings. Throughout this time, I always worked out of a traditional office space…until now. The new generation of coworking centers led by WeWork is challenging the way we think about the workplace. The rise of new startups and growth in the media, entertainment and technology sectors has spurred the growth of new communities of entrepreneurs and creative professionals who want to be part of something larger. It is the millennial generation that is driving the change, but industry veterans like myself have also been swept up by the co-working wave. Corporate America has also taken notice. Over 22 percent of the Fortune 500 are now WeWork members. Although co-working was initially created for the 1 to 2 person office, we are seeing enterprise solutions where companies have hundreds of corporate employees at a single co-working location. Microsoft and Royal Caribbean both have major operations operating out of WeWork locations in Miami. While WeWork is getting all the press, local and regional operators such as Buro, Pipeline and Serendipity Labs are providing solid competition. 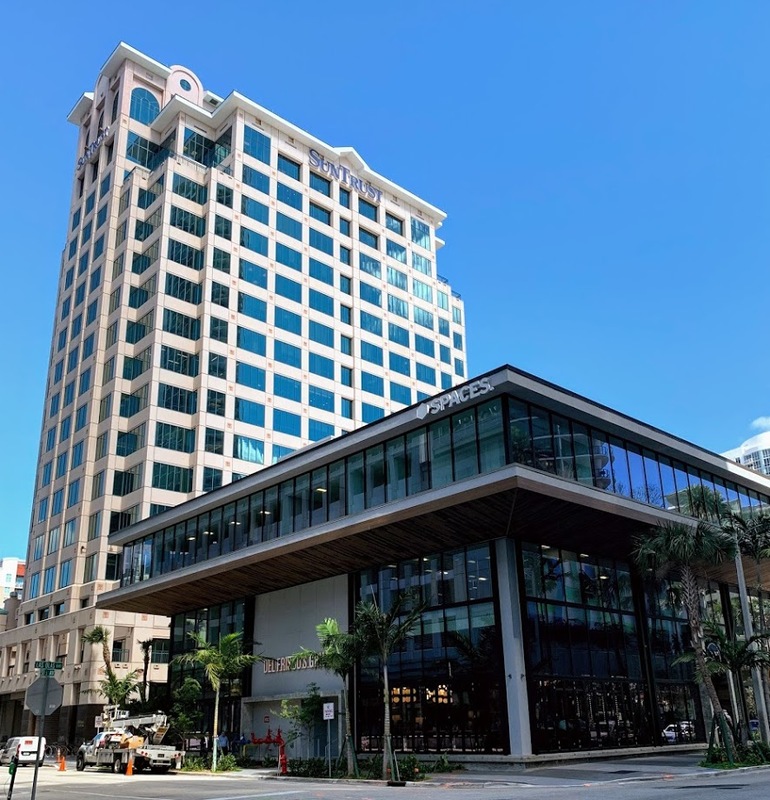 Meanwhile, Regus, the leader in co-working until WeWork totally disrupted the sector, has responded with its new concept, Spaces, with its first South Florida location in Fort Lauderdale set to open later this year. 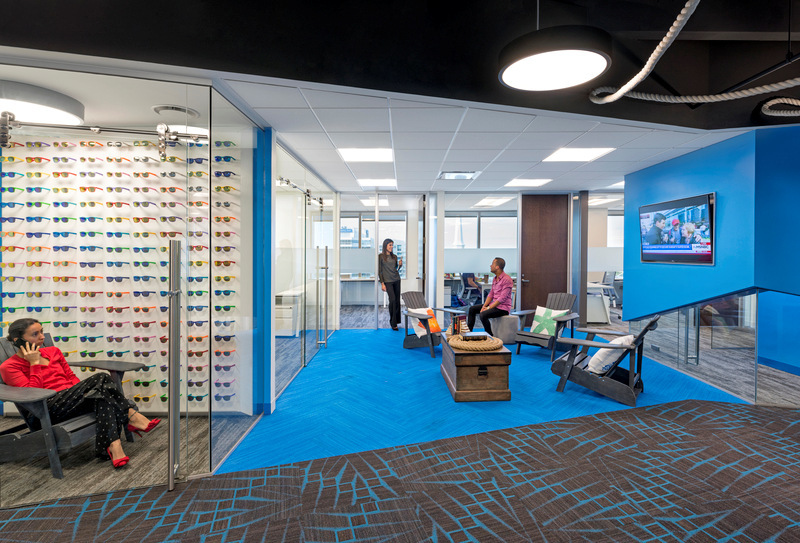 Regus, along with it’s traditional executive suite competitors like OfficeEdge and Quest continue to thrive by focusing on providing ancillary services to tenants. 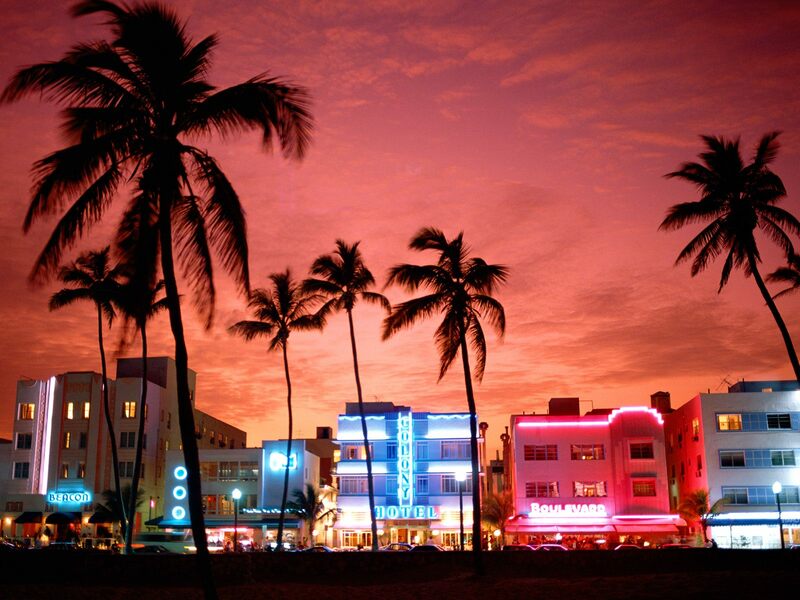 Miami, with its unique multicultural community and ties to Latin America and the Caribbean has developed a vibrant startup ecosystem which makes it a key target market for co-working facilities. While co-working accounts for 1.5 percent of office space in the U.S. Miami is the national leader with a full 3 percent of its space dedicated to co-working. Shortly after joining Truss, I leased a co-working space at Pipeline in Downtown Fort Lauderdale. I have a small glass enclosed office which is ample for my needs. It is an interior space, but there is plenty of natural light due to the glass partitions throughout. I have a great tenth floor view of Downtown Fort Lauderdale. While the true ocean views are a few floors higher, I can occasionally see specks of blue water. I also get 10 hours of conference room use per month, the use of a fully equipped kitchen and lounge, and all the coffee I can drink. I’ve got a laptop and Pipeline’s strong wi-fi signal, so I can work in my office, the lounge or in an Adirondack chair in the break area. I wasn’t sure if Pipeline was the right thing for a lifelong traditional office user, but I have to admit that I really enjoy my new home away from home and officially consider myself a co-working convert. Stay tuned to KensTrends as we continue to explore the coworking revolution. Buro, a regional operator of coworking centers has some of the coolest spaces in our market. This one is in Midtown Miami. So how does the cost of co-working compare to a traditional office space? That’s a great question – I’m so glad you asked. That will be the subject of a future blog article. But for now a future blog article. But for now, there is an app for that. 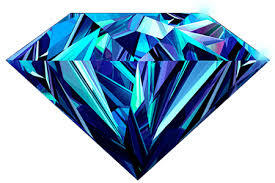 You can find it at truss.co. (Did you really I think you would get through this article without a pitch?) 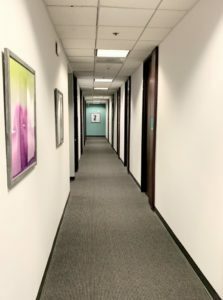 Our platform is the fastest, easiest way for small businesses to find their ideal office space with the help of artificial intelligence and virtual reality. We provide true price transparency so you can determine the most functional and most economical space for your needs. Sometimes it will be a traditional office space, sometimes it will be co-working space. Maybe it will be WeWork or Pipeline, maybe it will be Regus and it will often be a traditional office landlord like Blackstone, Hines or Crocker. It may even be an office condo. Truss will compare all alternatives on an apples to apples basis and help you make the best decision in record time. And we’ll even pay the tenant a bonus for leasing their space with Truss. Sound interesting? Check us out at truss.co or email me at ken at truss.co. Truss Goes Live In South Florida! Downtown Miami, Brickell, Wynwood, Doral, Fort Lauderdale and Boca Raton are some of the most popular South Florida markets on Truss’ platform to search, tour and lease. Business owners are also able to take advantage of Truss’ shared commission. “Truss is a great way for tenants to quickly and easily compare pricing on different types of space in different locations. As an architect, I appreciate their use of virtual tours and access to floor plans saving a lot of time in determining whether a space meets the my clients’ needs,” said Stephen Tewes, principal at Tewes Design Group. Truss also offers office space in Austin, Chicago, Dallas, Houston and Washington D.C., along with industrial and retail space in select markets, totaling more than 200 million square feet of space. New properties are added consistently on Truss, adding square footage and expanding the options for small business owners. Posted in Uncategorized	| Comments Off on Truss Goes Live In South Florida! Technology continues to change the way we do business almost on a daily basis. Why call for a taxi when you have Uber and Lyft? With Amazon, you can sh op for your underwear in your underwear, and why buy that timeshare when you can find a great place to spend your vacation on AirBnb? Meanwhile, Commercial Real Estate has stayed pretty much the same for the past 30 plus years that I’ve been in the business. There have been a few changes – it’s easier to send info, pictures and floorplans via email. Instead of having a research department, we now have a company that collects all of our listing info so they then can sell it back to us. And we’ve seen the workplace evolving with the rise of co-working. Otherwise its a series of phone calls, tours, a request for proposal with countless revisions and a few volleys of lease comments before we finally arrive in our new office space. Truss.co – best Real Estate tech site for 2017 and we’re only getting better in 2018. Can there be a better way? That’s where Truss comes in. Our platform allows tenants to use artificial intelligence to search for their space in minutes rather than days. Yes, we still need to physically tour the spaces, but our virtual tours can streamline that process. And instead of the dreaded eight page request for proposal, we have an online collaborative platform where broker, landlord and tenant can negotiate the proposal in real time without the need for several dozen calls and emails. And the lease itself can be stored on or off the platform to make it accessible to all parties involved. In addition, Truss provides total price transparency. Why navigate though what is a net lease, a gross lease and what modifications make up a modified gross lease? We put the tenant in the driver’s seat and boil it down to a monthly cost. Our clients can also compare the cost of co-working solutions to traditional office space. And by simplifying the process, we allow the tenant to share in our commission. I am pleased to announce that I have joined Truss Holdings Inc. as Regional Senior Vice President and will be introducing our groundbreaking online commercial real estate platform to South Florida. Truss, the smartest fastest way for small to medium sized businesses to find office space, was named the #1 Real Estate Tech Site for 2017 by cretech.com. Truss already has over 100 million square feet of available space on its platform in five major markets. South Florida is next on the list. Over the next 90 days, my task will be to add 10 million square feet and build the most comprehensive and user-friendly database of office availabilities in South Florida. Those who have worked with me in my 30+ years in the South Florida market know that I’ve successfully done it before. 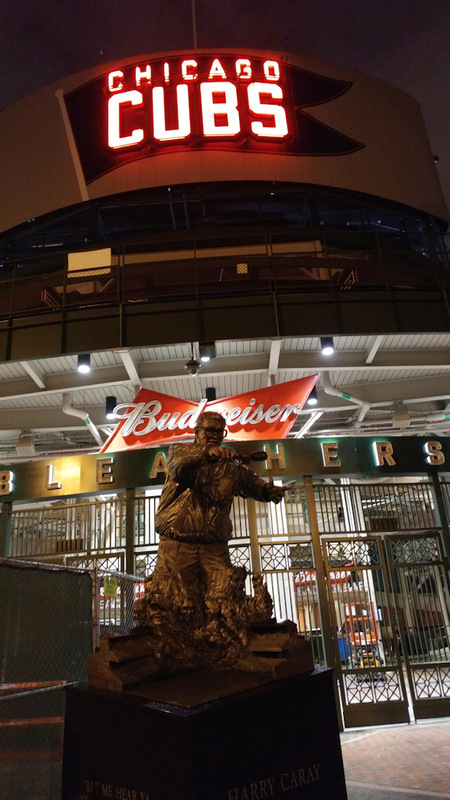 With the help of our Chicago based development and operations team, our serial entrepreneur founders and millions in venture funding, we are about to do it again. We intend to start in Miami-Dade and work our way north though Broward, Boca and the Palm Beaches. The South Florida site will be up and running after the 90 days. If you are a broker, I will be asking you to provide your inventory, but our technology will make that task significantly easier. This will save you time and we intend to help you fill your buildings and make more money. You’ll also love our online proposal system that can cut days or weeks out of the leasing process. I’ll be traveling throughout the market demonstrating the Truss platform to the brokerage community. And I’d be happy to bring in some bagels, sandwiches or beers. If you are a business owner, you can register to search for your ideal space. Vera, our virtual assistant will have you pinpoint some locations on a map and answer a few questions. She will then use her Artificial Intelligence (AI) to provide a list ranking the spaces on a 1 to 100 scale based on the answers. We also have exclusive virtual tours on the site through an alliance with Matterport. From there, you can shortlist the best properties and the Truss Representative (that’s me!) is alerted to set up a tour. Following the tour, the transaction moves to our online proposal system and then through the lease process. Because we have greatly streamlined the process and you share in the work, you also get to share the commission.You still get the benefit of professional representation, we put you in control of the process, and our people and our technology help get it done in record time! That is a brief overview of the Truss business model. We are focusing on the underserved market for small to medium sized businesses. We are not a data service, we are a web-based tenant representation brokerage. We want to be a marketing resource for building owners and Landlord reps to help them fill their most difficult spaces. And for business owners, we are making it easy to find a great deal on a space you love. Are you interested, excited, confused? Feel free to call, text or email me if you have any questions or visit www.truss.co (Note – we are .co not .com). Winds of change from the windy city will soon be making waves on Biscayne Bay. A special KensTrends for February. For Valentines Day, why buy your special someone Valentine Chocolates or even Jewelry when you can buy a Chocolate Factory or Jewelry Store. Or how about a preschool for the little ones? Still looking for the perfect Valentines gift for your special someone? Sure, you can buy a nice box of chocolates, but why stop with that? Buy the whole factory! And we’ve reduced the price to $140,000. I have a great chocolate shop in South Broward County. It has operated out of the same location for nearly 15 years. They also have a full menu of ice cream and specialty coffees. It generates over $80,000 in annual income so it’s a great value at the new price. Is jewelry more your speed? Let’s talk about my jewelry store in one of Broward County’s top retail locations for $599,000. And what about the kids? Well, mine are a bit older, but it sure would have been nice to buy them their own preschool. You still can for $3.5M. 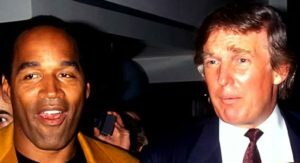 You may love our President, you may hate him, or maybe you understand both sides of the issue and hope he can still be successful. Regardless, we have a new tax law going into effect for 2018 and that law should benefit what I consider to be Florida’s number 1 industry. Is it tourism? Well, Disney and the beaches are still huge, but no. Orange Juice? Good guess, but the last thing we need in Florida is O.J. I’ve always considered, the number one industry in Florida to be Florida itself. We recently passed New York as the third most populous state in the US. 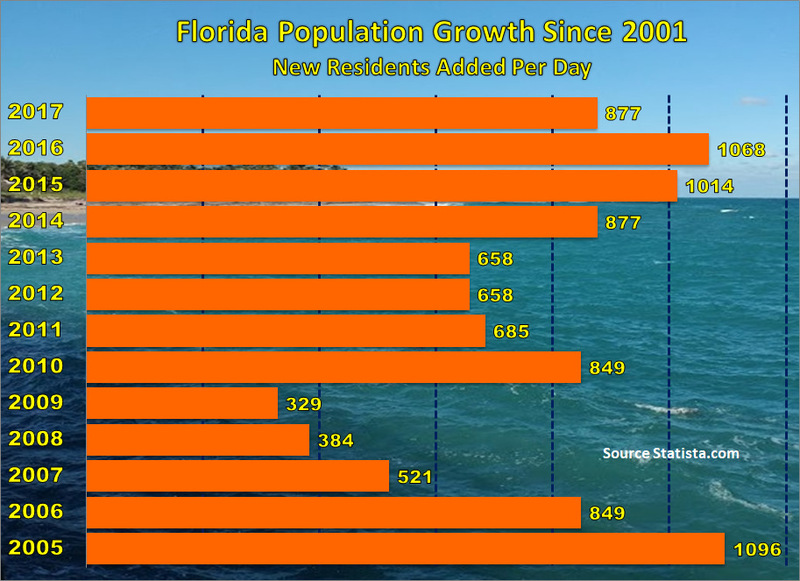 After some down years following the storms of 2004-5 and the great recession, Florida is back to adding approximately 1,000 residents per day. These new residents need housing, they need places to work, play and shop, they need attorneys, physicians and accountants, they need hair dressers and dog walkers and yes, even business and real estate brokers. 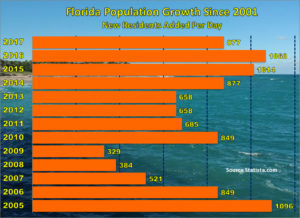 As long as Florida keeps adding residents, (provided we don’t destroy the environment) it’s going to be good for Florida businesses. While new residents have always been drawn to our sunshine and warm weather, you can’t ignore the impact of no State income tax. The new tax law eliminates the deduction for State income tax in New York and the 41 additional states with an income tax. This creates an additional incentive for companies and their employees to relocate to Florida. As we don’t expect Governor Scott to build a wall to keep New Yorkers out, the new tax law should further accelerate Florida’s growth. So we’re looking forward to a great year for our number one industry and for Florida business owners in general. Looking to buy or sell a business in Florida or to relocate yours? We’d be happy to help! Did you ever wish you could go back to preschool? Those carefree days of fingerpainting, show and tell, field trips; and who couldn’t use some nap time. 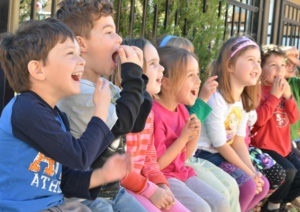 In New York, adults pay $333 to $999 to re-create the preschool experience. Well, we have a better idea. Why not own your own preschool. It may cost a bit more at $3.5 million, but it’s a great investment opportunity presented by Capital Business Solutions and Stigliano Commercial Real Estate. Education has become big business. The preschool industry continues to grow rapidly due to the demand created by dual income households, and the increased realization of the importance of early childhood education. Between charter schools, private schools, and preschools, we are seeing tremendous investment in education properties. Charter schools and preschools with Voluntary Pre-Kindergarten (VPK) programs also receive some of all of their revenue from the government which is very attractive to investors. 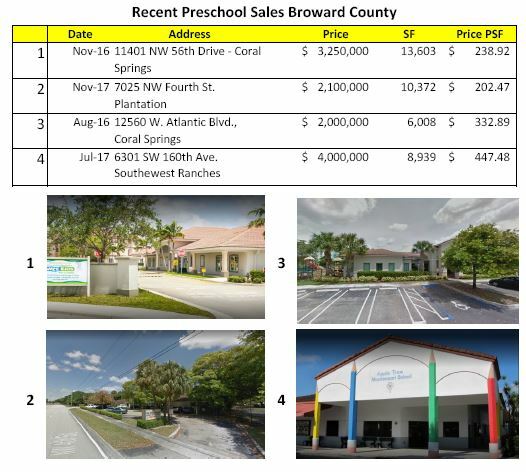 School buildings also attracting some impressive prices per square foot (see below) and have become prime triple net investment targets similar to a Starbucks, Wawa or Walgreens, selling at cap rates of 6 to 7 percent. The U.S. Bureau of Labor Statistics projects that education will be one of the strongest sectors for employment growth through 2020. The Learning Experience, founded in 1980 in Boca Raton, is a prime example of how child care has become big business. The company was sold in 2014 to New York-based private equity fund Quad Partners and Palo Alto, California-based Norwest Venture Partners. They recently leased a 39,000 sf corporate headquarters here in Deerfield Beach. 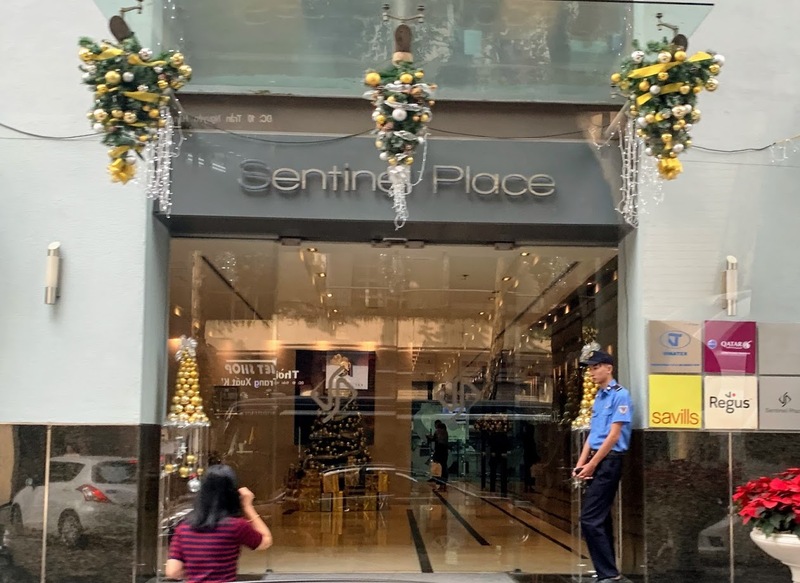 Their school buildings have become prime triple net investment targets similar to a Starbucks or Walgreens, selling at cap rates of 6 to 7 percent based on the stability of the industry and the financial strength of the tenant. The Learning Experience’s long-term plan is to have 30 to 40 facilities in South Florida. Other major national players in the industry include Kindercare, Learning Care Group (La Petite, Tutor Time) and Bright Horizons. But the business remains primarily fragmented among local entrepreneurial owners. According to IBIS World, only 7.3 percent of the $48 Billion in industry revenue is generated by the top four providers in the market. So for those entrepreneurial owners, Capital Business Solutions is marketing an 11,000 sf preschool on 2+ acres which generates $750K per year in revenue with room to grow. Contact us for more information. Do you own a preschool? We are also working with some active buyers looking to expand their operations. Special thanks to Laurel Oswald, Jon Blunk and Joody Andre at Tower Commercial Real Estate for a great lunch, some amazing views and a super presentation by Jenni Morejon of the Downtown Development Authority. Tower hosted our May 11 meeting at the Tower Club at One Financial Plaza. If you missed the presentation, shame on you. The good news is that we have Jenni’s presentation here on the blog. The bad news is that I wasn’t able to save you a piece of cheesecake. Over $2 Billion in post-recession investment is either planned, completed or under construction in the CBD. This includes the new 750,000 sf County Courthouse, 11,200 residential units, 1.5 million sf of office, 433,000 sf of retail and 1,200 hotel rooms. In addition, the new wave streetcar project is in the works with service to start in 2020. While supply will be increasing with the new development, strong demand has driven residential rental rates up by 40% over the past five years and Class-A office rental rates are up by $4 over the past 12 months. We are looking forward to more on the CBD market next month when Stiles presents details on their new downtown mixed use project.